The historical background of our group, as well as much of its current focus, lies in studying materials properties on an atomic scale from an ab initio perspective. Wet Electrons: One of our projects is to study the behavior of a "wet electron," an excess electron surrounded by water molecules, with the eventual goal of predicting the diffusion constant and other properties. Dimers: Numerical studies have led to a greater understanding of dimer molecules on Silicon surfaces, and have shown how their states can be dynamically read and written by the tip of an STM microscope. MITite: A new class of semiconductors, tentatively dubbed MITite, is designed using ab-initio first principle calculations. One particular application is for monolithic integration of optical-active components with electronic devices. Finite Temperature Path Integral Method: In this work, path integral method is explored for computational simulation of the wavefunctions of fermions and bosons. 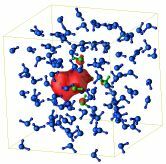 Hyperdynamics: An accelerated molecular dynamics formulation is used to investigate Si.